Fran Wilson MOODmatcher Lipstick, 6pc Collection by MOOD MATCHER at MSF Lashes. MPN: 10898039. Hurry! Limited time offer. Offer valid only while supplies last. Step out with confidence knowing that MOODmatcher lip color will take you from work to play, certain that your lip color will last all day. Step out with confidence knowing that MOODmatcher lip color will take you from work to play, certain that your lip color will last all day. MOODmatcher makes lip color easy, eliminating the guesswork. Our unique formulation works with your body chemistry and skin tone to create a totally unique, customized, flattering shade that is yours, and yours alone. With clinically proven staying power, MOODmatcher stays put for up to 12 hours, with no touch up. You can eat, drink, smooch and smile without smudging, feathering, bleeding or fading. Enriched with Aloe Vera and Vitamin E, MOODmatcher delivers supreme hydration that will last all day. Your lips never had it so good. The Original 12 HOUR longwear lipstick with clinically proven staying power and long moisturizing benefits. Enriched with Aloe Vera and Vitamin E, delivers supreme hydration that will last all day. Each color changes instantly to a shade totally unique and and personalized for you. 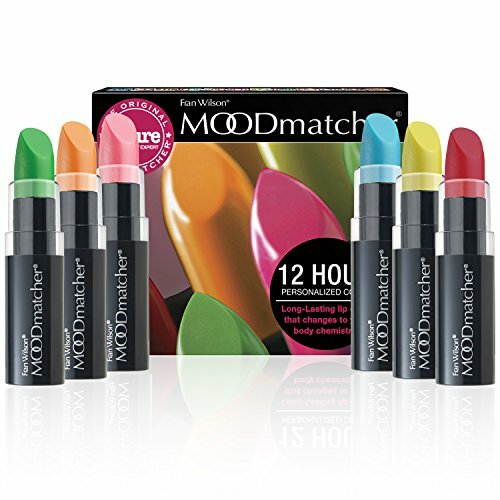 MOODmatcher lipstick is formulated to respond to your body chemistry. You can eat, drink, smooch and smile without smudging, feathering, bleeding or fading, waterproof and no touch up needed. For best results, wait 2 minutes for your MOODmatcher lipstick color to reach its peak of personalized color. If you have any questions about this product by MOOD MATCHER, contact us by completing and submitting the form below. If you are looking for a specif part number, please include it with your message.